With this week’s focus on the newest research on autism prevalence, let’s look at benefits of babywearing for kids with ASDs (autism spectrum disorders). My son and I participated in the Autism Piece Walk 5k last year. This was the first time I put some effort into thinking about babywearing and kids with special needs. There we were, in a sea of people, elbow to elbow. Loud music. Cold Oklahoma wind blowing. Most kids and adults, including me, were getting overstimulated. Then I noticed the moms and the dads, front carrying their children, toddlers to middle schoolers, in their arms. I couldn’t help but think, “That would be so much easier to do with a wrap.” When we hold children, we instinctively sway, bounce, or rock them. This provides stimulation of the vestibular system in the brain. This is very important to neurologic development and can be calming to the child and adult. Some children need more vestibular stimulation than others. It is thought by some that children with ASDs may have a higher need for vestibular stimulation than others and participate in self stimulatory behavior (stimming) in order to meet that need. It is theorized that babywearing could reduce socially distracting stimming behaviors. Research is needed in this area. 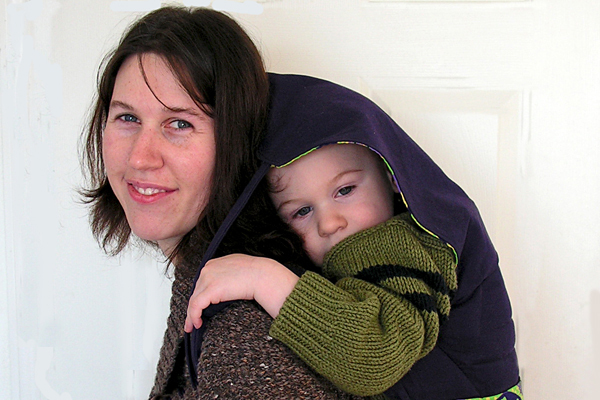 Babywearing can also provide the child with a way to reduce overstimulation. Contoured panels wrap around the child’s body and can provide pressure that calms some children with autism. Some carriers have hoods that fit over the child’s head. Pulling their arms into the carrier means they are only exposed from the knee down. This entry was posted in autism spectrum disorders and tagged ASDs, autism spectrum disorders, older children. Bookmark the permalink. Great article, I felt as if I were on your walk and learned many new things. I am off to look at the Kanga XT now.